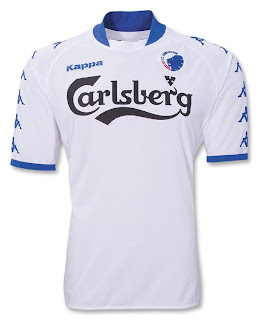 For those who aren't fluent in Danish, beyond the cheese kind, that's FC Copenhagen 09/10 Home Soccer Jersey! It's been too long since we've offered gear for Danish giants, known as Byens Hold (The Citys Team)& Løverne (The lions). Having Kappa as their shirt manufacturer, the Danes get some mega style and stretchy fit, as this cool white shirt shows that bold Kappa logo down both sleeves, and it is made of 95/5 polyamide/lycra (can you think of anyone else who makes shirts out of this?!) for a superior level of flexible comfort.